Zipangu Japanese Restaurant is a quaint little place on the corner of Port Street and Wharf Street in Port Douglas. Zipangu is quite small and cosy. It is open for lunch and dinner service 5 days a week. The days of operation at Tuesday to Saturday inclusive. Lunch service is from 12 till 2pm on these days and dinner service runs from 5.30pm till 8pm. As Zipangu is small and very popular it is wise to book especially if there are a few people in your group. The Japanese chefs at Zipangu offer the usual delicacies you would expect from authentic Japanese cuisine including Sushi, Bento Boxes and Udon Noodle soups. The dinner menu has such favourites as Beef or Chicken Teriyaki, Chicken Kara-age and Dinner Boxes. Of course Zipangu also has a wide selection of freshly made Sashimi and Sushi as well. At Zipangu vegetarians are also well catered for with many delicious tofu dishes being on offer. Desserts at Zipangu Japanese restaurant are simple but enticing including such favourites as Green Tea Ice cream, Black Sesame Ice cream and Banana Spring rolls. I cannot get enough of the Sushi at Zipangu. I dearly wish they were open seven days a week! I like to stop in and grab a few selections of Sushi rolls and head down to the Esplanade near Four Mile beach and have a picnic. 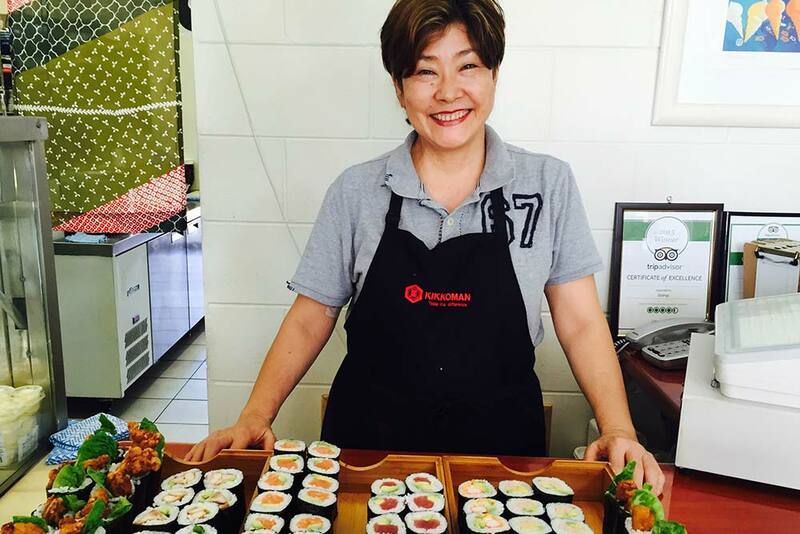 The other place to go with your fresh sushi from Zipangu is Anzac Park at the end of Macrossan Street. Nothing better than watching the boats come in of an afternoon whilst snacking on the amazingly good Sushi from Zipangu ! Zipangu Japanese restaurant can also do Sushi and Sashimi platters for events and functions. Or if you are in holiday mode you can call Zipangu Japanese restaurant and order a selection of Sushi for your dinner. Just make sure you call through and order in advance. The telephone number for Zipangu Japanese restaurant is 07 40 996718. The produce used at Zipangu Japanese restaurant is sourced locally and the delicious meals are created with passion by the chefs – you can taste it all in every delicious mouthful. Zipangu Japanese restaurant is very highly recommended.